From bias-cut slips at Alexander Wang to Hedi Slimane’s tribute to Courtney Love-era Glastonbury style at Saint Laurent, the Nineties fashion trend that you ignore at your peril. As we were digging out the DMs and trying to work out how to make a grey normcore hoodie look a bit more stylish than, well, a grey normcore hoodie, we got to thinking: wouldn’t it be, like, amazing to remind ourselves of all the Nineties fashion moments we loved – from the actual Nineties? Join us as we take a trip down memory lane to bring you….the Nineties Looks You Could So Still Wear. 2. Claire Danes in My So Called Life. The TV show that launched a thousand henna-red hair experiments. Not to mention checked shirt-and-DM-boot combos. 3. Claudia Schiffer in Versace, 1994. 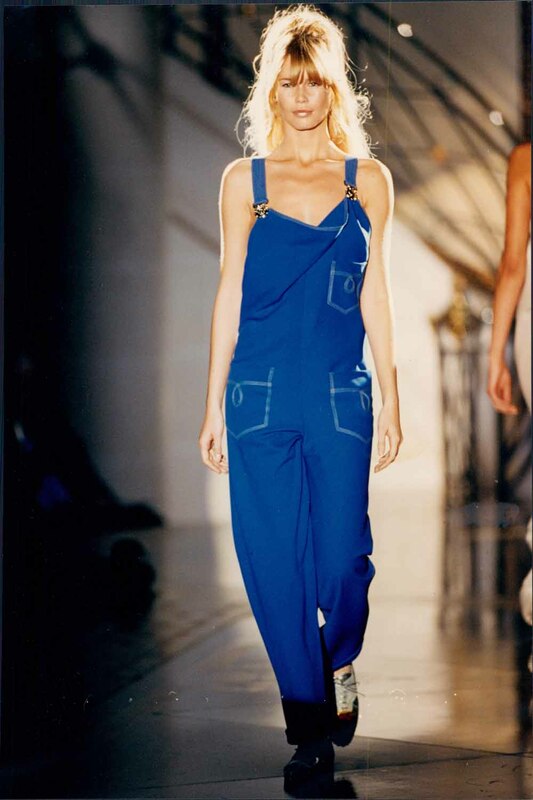 You wouldn’t even have to have Brigitte Bardot hair or Teutonic cheekbones and these dungaree dreams would still look cute. 4. Kate Moss in Antonio Berardi, 1997. Kate Moss and Nineties fashion moments – where do you start? We’re partial to this lesser-known one from her days as a hardworking runway show pony. We’d even still team it with that lip. 5. Trish Goff in Calvin Klein, 1997. These days, the fash folk love a ‘1990s Calvin’ reference. Well, ladies, here’s the real thing – does that white shoe-glove style remind you of anything? A strong whiff of our current Celine obsession, maybe? 7. Cindy Crawford on a film set, 1992. Ah Cindy, how we will forever want your hair, your body, your mole…but to be honest, we’d still settle for your way with a perfectly-knotted white shirt and cut-offs. 8. Kate Moss at the CFDAs, 1999. So, back to Kate. Backless, maxi and shiny – could it look any more modern? 9. Ms Goff (again) in Tom Ford-designed Gucci (again), 1996. Red velvet tux, boyfriend shirt – need we say more? 10. Christy Turlington, 1996. If you ignore the ‘Fashion Cafe’ logo (who actually thought that a supermodel eatery serving burgers was a good plan? ), Christy’s oversized bomber jacket – the It shape of none other than AW16 – could literally be on our backs right now. 11. Naomi Campbell and pals in Versace, 1999. OK, we might give the diamond lariat necklace a miss and add a foot or two to the crotch-skimming hemlines, but the liquid silver sparkle is still tres SS16 – see Saint Laurent, Vetements and Isabel Marant to name a few. 12. Liv Tyler, 1995. The crop top, the mini kilt, the pout. All still so relevant today.